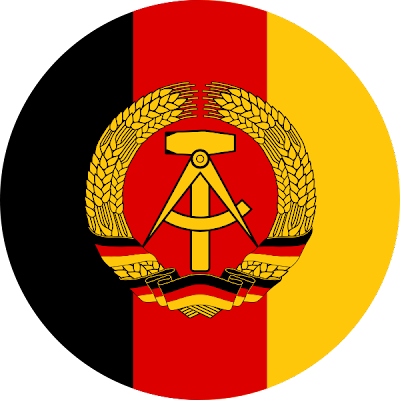 The Landstreitkräfte or LaSK (Ground Forces) was the principle branch of the East German National Volksarmee (National People's Army) tasked with land warfare. The Landstreitkräfte itself was officially established in March 1956, from elements of the Kasernierte Volkspolizei (Barracked People's Police). 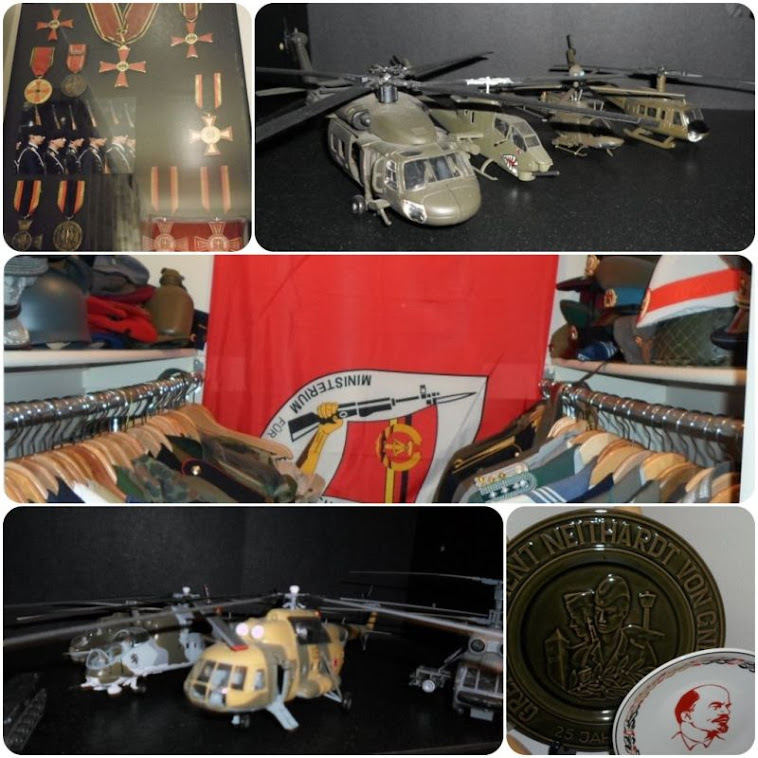 The majority of it's equipment was of Soviet design and origin and it's units were organized along the lines of Soviet Motorized Infantry Divisions, it also operated in close proximity to the Red Army's Group of Soviet Forces Germany (GSFG) . Land Forces were divided into two distinct military districts with Military District North headquarters located in Neubrandenburg and Military District South with its headquarters located in Leipzig. The Ground Forces were also responsible for maintaining several specialized warfare units such as the 40. Fallschirmjägerbataillon Willi Sänger (40th Paratrooper Battalion Willi Sänger). The national insignia of the East German Landstreitkräfte (LaSK) as applied to their vehicles. The Landstreitkräfte was never deployed in combat however, it was often reported that it's personnel went to numerous socialist and communist nations as military and technical advisors, particularly Cuba and various countries in Africa. In 1968, the Ground Forces were mobilized to assist Soviet forces in intervening during the Prague Spring uprising in Czechoslovakia. When reformist Alexander Dubček attempted to grant additional rights to the citizens of Czechoslovakia by acts of partial decentralization of the economy and democratization, Soviet forces and their Warsaw Pact neighbors invaded the country sending thousands of soldiers and tanks pouring across the border and seizing control of the country. The East German Army was essentially stood down and their deployment into Czechoslovakia cancelled at the last moment thus ending any East German involvement in the invasion of Czechoslovakia. The Landstreitkräfte maintained a force of nearly 120,000 troops of which at any given time about 60% of which were draftees. It maintained two tank divisions, four motor rifle infantry divisions, two surface-to-surface missile brigades, ten artillery regiments, one anti-aircraft regiment, eight air defense regiments, one airborne regiment, two anti-tank battalions, and various other support units. The uniform displayed here shows the Paradenuniform (Parade Uniform) of a Oberstleutnant (Lieutenant Colonel) in the Landstreitkräfte's Mot.-Schützen, or Motorisierte-Schützen (Motorized Infantry) known in western Armies as Mechanized Infantry. The uniform is made of the smooth gabardine material in the military stone grey color. When wearing the Paradenuniform, the steel East German M-56 Stahlhelm (Steel Helmet) was worn instead of the round visor cap. The East German M-56 helmet was originally designed in 1942 as a replacement for the M1935/M1940 model Stahlhelms. The design was rejected by Adolf Hitler and never progressed remaining unused until the requirement for a new German helmet for the Volkspolizei and the National People's Army arose. It soon became realized that the reintroduction of the traditional Stahlhelm would not have been tolerated by the East German's Soviet allies.The 1942 design was likely chosen because it was the most similar of all German designs to the most recognizable Soviet helmets, in particular the iconic SSh-40 design. Indeed, the M-56 was similar enough in appearance to the SSh-40 that some Westerners failed to realize its German origins altogether and assumed the East Germans had adopted a Soviet design. The helmet was revolutionary for its design with a liner riveted into the steel shell and upon ballistic contact to the helmet, the steel shell was ripped away absorbing ballistic force and leaving the wearer to reach for cover. Shown here is the Kragenspiegeln (Collar Insignia) of a Landstreitkräfte officer. Shown here is a close up of the shoulderboard insignia for an Oberstleutnant (Lieutenant Colonel) in the Landstreitkräfte with the silver officer braiding and gold pips of a senior officer against the white background of the Ground Forces. Worn on the right side of the Parade Uniform is the silver Achselschnür (Shoulder Cord) issued to all East German officers worn primarily for Parades and on the Gesselschaft uniform jacket. The elaborate braided silver shouldercords with pointed silver Metallspitzen (Metal tips) of the aiguillettes were originally introduced into service in 1976. Here is the officer's brocade belt with East German coat of arms. It was worn with the parade uniform and formal uniform and attached to it was the Ehrendolch (Honor Dagger) which was presented to each officer upon graduation from the respective service academy. The Parade uniform would be worn with the unpiped riding breeches and the polished black jackboots when participating in special events such as the annual Ehrenparade (Honor Parade) which celebrated the founding of East Germany. These parades were conducted in East Berlin before senior communist party officials including Erich Honecker, leader of the GDR and visiting dignitaries. They were modeled heavily on Soviet military parades through Red Square in Moscow with a Germanic twist. Soldiers maintained the traditional Prussian 'goosestep' straight legged march outlawed in West Germany for its affiliation to the previous regime. The march was usually performed accompanying the sounds of a special military band playing traditional marsches written by famous German composers such as Mozart and Beethoven. Here's a close up of the ceremonial dagger hangers and the dagger in it's decorative metal sheath. The decorative engraving and raised East German coat of arms on the sheath of the Ehrendolch. Heres a picture of the dagger outside of the sheath with images of the blade itself and the stamping of the serial number in the base of the blade before mounting into the hilt. With the Dienstuniform (Service Uniform) The staight legged pants with white piping of the Army was worn in place of the breeches and the M-56 steel helmet was replaced with the standard issue round visor cap. The visor cap shown here for a Landstreitkräfte officer in the stone grey color of National Volksarmee uniforms along with its associated white piping of the East German Ground Forces. It retains the East German national roundel in the center surrounded by a metal wreath insignia and officer's silver braiding cap cord around the base above the visor. Note the interior marking of NVA for the East German National Volksarmee. This visor example shown here carries a letter 'Y' designation meaning the visor was manufactured in 1988. The number beneath the NVA stamp represents this example is 56cm or roughly 7in by American sizing equivalents. 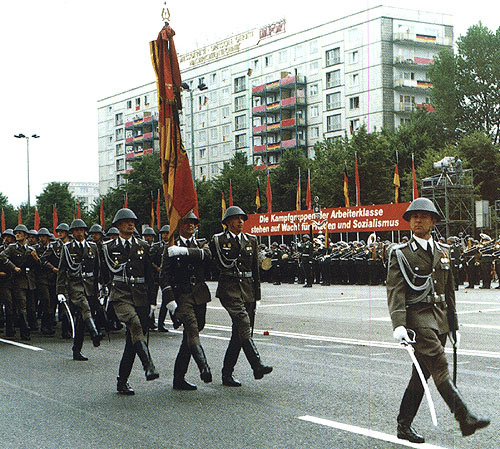 In the video clip shown here from the official East German state television broadcast, Soldiers of the East German National Volksarmee march during the Ehrenparade of October 1987 in East Berlin. Great site, especially for us Cold War Wargamers looking for details on the NVA. That video, it sends a chill down my back when I see any military unit doing the Goose step, it's like a subconcious message that says "Were are unfriendly". Thank you for visiting the site and for leaving feedback to my endeavors. I will continue to try and provide quality posts for the artifacts and knowledge that I have hopefully I can continue to influence your interest in the subject matter for you to include in your wargaming experience.